Just when it seems the Peoples Democratic Party (PDP) was finally putting its house together ahead of the 2019 general elections, it appears that the issue of who picks the ticket of the party for the 2019 presidential election may once again unsettle the party. If emerging reports are any indication, the PDP has found itself in a somewhat insoluble dilemma over whether or not to opt for a direct or indirect primary election to pick its presidential flag bearer for the poll that comes on February 16, 2019. The party may also set itself on a path of fresh crisis if it decides to pick a consensus candidate to run against President Muhammadu Buhari in the 2019 presidential elections. At the moment, about fourteen members of the PDP have thrown their hats in the ring to run against President Buhari in 2019. Among them, two appear the strongest contenders who may be able to defeat the president at the poll. They are former Vice President, Atiku Abubakar and former Kano State Governor and serving Senator, Rabiu Kwankwaso. The other aspirants vying for the 2019 presidency under the platform of the PDP include returnees to the opposition party: Senate President Dr. Bukola Saraki and Sokoto State Governor, Aminu Tambuwal. Others include former Jigawa State Governor, Sule Lamido, and former Kano State Governor, Ibrahim Shakarau, Ekiti State Governor, Ayodele Fayose. Others are former Sokoto State Governor and former House of Representatives member, Attahiru Bafarawa, Governor of Gombe State, Ibrahim Dankwambo, former Plateau State Governor and serving Senator, David Jang, former Kaduna State Governor and chairman of former National Caretaker Committee of the PDP, Ahmed Makarfi,former Minister of Special Duties, Tanimu Turaki, and former House of Representatives member, Datti Baba-Ahmed, and former Cross River State Governor, Donald Duke. 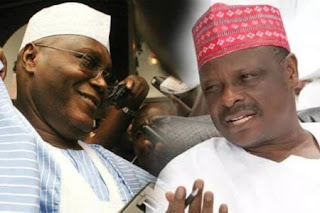 Among all these presidential candidates, party stalwarts believe Senator Kwankwaso and Mr Atiku are the most promising contenders likely to do the job for the PDP. But an earlier analysis by THE WHISTLER show that in terms of political strength, the former Kano State Governor stood a better chance of winning the presidency for the opposition party if picked as the party presidential flag bearer. But the party may have found itself in a huge dilemma over who to give its presidential ticket between the two men. Sources in the party explained that Kwankwaso is favoured as the party flag bearer by members of the party in the North who believe he’s the only one with the support base to defeat Buhari in his strongest political base. The former Kano State governor’s strength lies in his dominance of most northern states, especially Kano-his home state. But supporters of Atiku also argue that the former Vice President is a northerner who is very popular in the Southern parts of the country, unlike Kwankwaso whose popularity may be limited to the North. The arguments for the two candidates , according to a source who spoke to this medium, has put the opposition PDP in a predicament as to who should emerge its candidate to run against an equally popular Buhari. “[Restructuring] is doable. In fact, what I’ve told many Nigerians at home is that if you give me six months, I know I will be able to achieve a fast level of restructuring, otherwise the concurrent list issue,” Atiku had said while delivering an address at the Chatham House in sometime in April, adding that “It’s very easy to deal with it because there is no state that you will call and say ‘I want to give you this responsibility together with the resources’, and will say ‘no’. He had on different occasions told the North that if embraced, restructuring will favour both sections of the country and not just the South. Another reason why the South will presumably root for Atiku’s candidacy in the 2019 presidency will be his previous cultivation of friendship among Southern elites while he was Vice President to former President Olusegun Obasanjo. His penetration of the South while serving as Obasanjo’s deputy had aroused speculations at the time that he may run against his principal in the 2003 presidential election. A PDP stalwart from Taraba State told this medium that in the North, Atiku is not seen as an ideal northern leader. The party chieftain told our correspondent that even in Adamawa state, it is not all the elites that are rooting for the former Vice President in the 2019 presidential election. He said Atiku is seen more as a selfish politician whose businesses are mostly profit-making ventures that do not benefit the common man despite the fact that he has allegedly made tremendous resources from the government. So, the discrepancy between Kwankwaso who wields a huge followership in the North and Atiku whose political strength lies in the South has put the PDP in a unique dilemma. The suspected drift of the party’s kingmakers towards Kwankwaso has rattled some of the aspirants who are now calling for a level playing ground. Atiku and Makarfi have both emphasized that the party must provide level playing ground for all aspirants of the party to thrive. But in what is seen as a swipe at some of the other aspirants, Kwankwaso had boasted recently that if the PDP must unseat President Buhari from office in 2019, he is the candidate to do the job. He warned that the opposition party must ensure its presidential candidate emerges from the North West which is the most popular northern geopolitical zone and where the president hails from, if it hopes to defeat the APC candidate . “If you are selecting a candidate, you have to under this circumstance look at the geography, history and population of the country. It is a common knowledge based on previous census that Kano State is the most populous state and North West is the most populous region in the country. “So, if it is true that our former party [the APC] is fielding a candidate from the North West, it is also necessary for the PDP to consider fielding its candidate from the zone,” said the Senator who himself is from the North Western region. But Makarfi, who is from the same North West region as Kwankwaso, had slightly disagreed with the Senator. He said, “That’s his personal view. One can only try to understand what his reason could have been. “I have not discussed with him, but his reason may be because of the high voters’ registration and large turnout usually seen in these states. “But that is not the position of the party. The position of the party is that the presidency is zoned to the 19 northern states and FCT. So it is open to aspirants from the 19 northern states and FCT. “So, whoever the party men and women find suitable from the zone as its presidential candidate, we will support him. It happened before when we saw a presidential candidate come from a small state and he was widely accepted and supported. “Kwankwaso is expressing his personal opinion. It should not be construed to say that it is a right and the exclusive preserve of certain states. I don’t think he could have meant that but for me the position of the party is very clear,” the former PDP caretaker committee chairman had said in reaction.